I recently started teaching English at a new location in West Valley on 3500 S. Last Monday night before class I had a brilliant idea : TACO SHOWDOWN. There are two taco stands I know of which are right across the street from each other on 3500 S. I decided that I would try tacos from each of them the same night and see which one would be the winner. It was serious. There was pico de gallo everywhere. I got a lot of salsa in or around my mouth. But I am a taco journalist. There was work to be done. So which one did I like more? Which one will I be hitting up more often as I fuel up before teaching English? Who emerged victorious in this TACO SHOWDOWN?!?!?!?!?! Well, you can just scroll down and find out. AND NOW…. LET THE TACO SHOWDOWN BEGIN!!!! 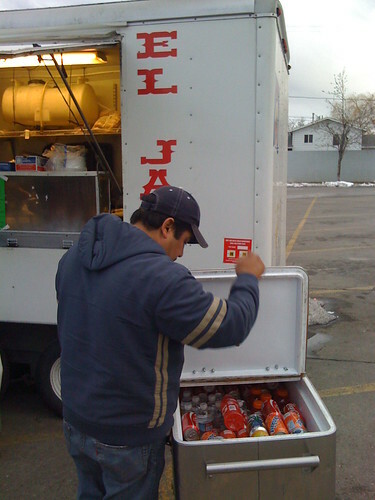 Taco El Jaripeo is a very popular taco stand in West Valley. I saw carloads of people come and go in the time I ate my 3 tacos. In keeping with my guidelines with my TACO SHOWDOWN with “Tacos Alex” across the street, I decided to order 1 al pastor and 1 lengua. Then I asked which of their tacos they felt I should add for my round 3. They said their carne asada was particular delicious, so I told him it was time to get the TACO SHOWDOWN on the road. He went to work and served me up a warm champurrado while I waited. This hit the spot while I waited on a cold February night. While I waited, I snapped a few photos of the stand and a few of its clientele with permission of all. I couldn’t believe how many people went in and out of this stand. Trucks and cars were pulling in and out at a constant rate. At least 2 families were staying warm in trucks eating their tacos while they watched me in the cold with my champurrado to keep me warm. One after another latino families came and went. My hands started shaking from excitement not the cold as I surmised from the stream of people that this must be a great stand. Then I heard some English as the guy called to me to grab my 3 tacos. Being predictable, I dug into the al pastor first. Medium. Medio. I already started worrying that the tacos would not be as good as I was hoping. Then I tried the lengua. The lengua was good, but a bit still not as good as I was hoping. Then I tried the carne asada that was recommended to me. Once again, it was good. But it did not live up to my hopes. There was nothing bad about the tacos. 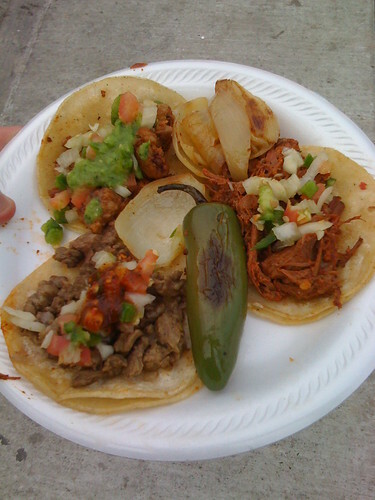 In fact, these were better than most of the tacos in the 800 S State area. Especially at the price of 3 tacos for $3.00. But overall, my tacos were medium. A thirsty gentleman picks out a beverage to chase his tacos with. When asked if I could take his picture he replied, "No me importa". So I did it. I've been to Tacos Alex for at least a couple years now. To this day it is delicious. 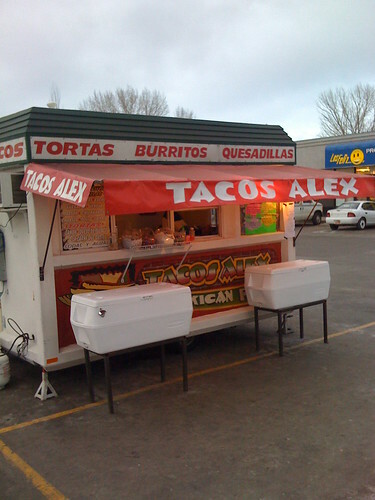 It’s been at least two years since I had been to Tacos Alex. 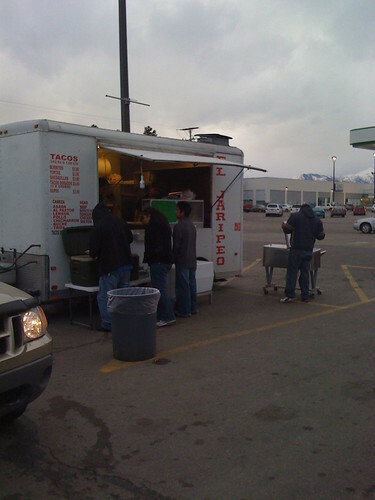 A friend of mine first brought me there one summer night to celebrate and try what he said were his favorite taco cart in Salt Lake. While I was in the area this week I stopped in and decide to try it out again as part of a TACO SHOWDOWN between this cart and “Tacos El Jaripeo” which does business directly across 3500 S.
In an effort to be fair I made sure to try 2 of the same style of tacos : 1 al pastor and 1 lengua. Besides these, I asked the cook which taco they felt was a good representation of their food. The two people working at Tacos Alex told me that I should try the barbacoa so I agreed and ordered one of those. The old woman cooking also asked me if I wanted cebollitas and told her that some onions sounded great. While I was waiting for my food, I asked them if I could take a few pictures for a review of the taco stand. They gave me a confused and nervous look. They asked why and I told them that I was a taco journalist covering all the taco stands possible in Salt Lake City. They still looking a bit confused and did not quite believe me (I left my taco journalist badge at home that night). Finally I paraphrased my goals of the site which I have outlined here. After this, they were excited. They quickly asked for the web address and wrote it down saying they were excited to check it out. 1 al pastor, 1 barbacoa, 1 lengua. Also featured is a big fat pepper and some delicious onions up top. They handed over my tacos and I dug in. First I tried the al pastor. It was good but nothing terribly exciting. Flavorful, but more or less medium. When I asked them how their pastor was, they seemed to admit with a bit of a shrug that it was not their best taco. Then I tried the lengua which was much better. The meat was very tender and was very juicy without being full of grease. The lengua was delicious with a few of the large onions in there. At last I tried the barbacoa. One of the best barbacoa tacos I’ve had in town. Delicious. I don’t remember that I’ve ever tried the barbacoa at this stand before but I will definitely order this one from now on. Tacos Alex also has a large menu of Tortas on the right of the window. Next time I will have to try some of these like the Milanesa. The prices at Tacos Alex are very reasonable. 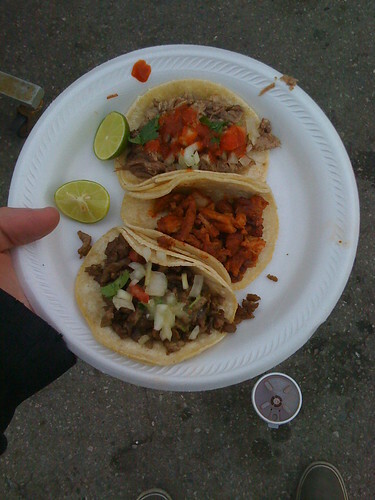 I had 3 tacos for $2.50 which is a much better price than what you pay these days around the Sears \ 800 S State area. So check it out. Hopefully the owners of the stand read this review and are happy with them. I will definitely be stopping in more on Monday nights since I will now be teaching and English class very close to Tacos Alex.